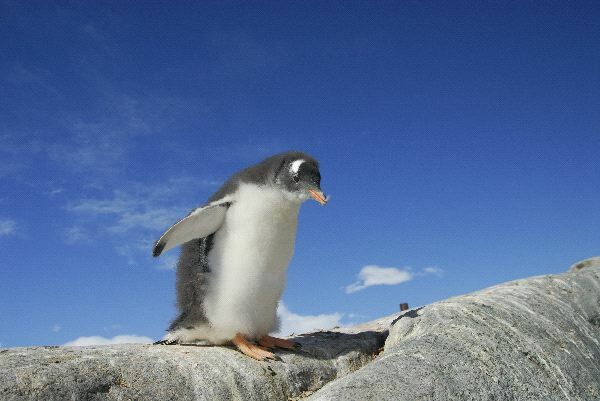 The Gentoo Penguin has a very large white stripe across the top of the head that distinguishes it from other species. They can grow to a size of 26 inches tall. They are very social creatures and form groups that can be very large. They may weigh up to 18 pounds depending on where they live. The Gentoo Penguin eats mainly crustaceans and fish. They are opportunistic feeders meaning they will eat what they can when they can. For example should the Gentoo Penguin see squid they will consume it. The biggest threat to this species of penguin is the Leopard Seal.